Friends of Palestine WA organised a speakout in support of the “free speech and a free Palestine” on Friday 12 August. The next major action for Palestinian human rights in Perth is the rally and “rogues tour” on September 17 beginning in the Murray Street Mall at 1pm. The Murdoch press in its zeal to attack the Palestinian Boycott Divestment Sanctions (BDS) campaign has misrepresented facts and even ran an entire article quoting a fictional character that simply does not exist. The invention of Max Brenner the Jewish chocolatier demonstrated the lack of integrity and journalistic ethics employed within the Murdoch press’s campaign against the pro-Palestinian advocacy groups who have called for a boycott of the Israeli owned Max Brenner chocolate franchise. Despite overwhelming evidence to the contrary, senior reporter Cameron Stewart (The Australian: August 20, 2011) still referred to the protests against the Max Brenner franchise as “marching on a Jewish-owned chocolate shop” and repeated the claim that BDS aim to “harm a legal Jewish business”. This deliberate misrepresentation of the corporate Israeli franchise directly link to the military and of the BDS protests is part of a larger campaign by The Australian that is carefully orchestrated to play on Jewish stereotypes and to shamelessly manipulate the emotions of the Jewish community creating an atmosphere of fear, mistrust and hostility. Most astounding was the article’s reference to Max Brenner as “the man whose real name is Oded Brenner”. This is very revealing of the journalistic spin used to distract and misinform readers about these legitimate protests. Putting the spotlight on the man behind the name behind the cooperation is a cheap tactic, a diversion meant to humanize a corporate entity for the purposes of adding to the demonization of the protestors. But wait, there is more! The Australian pursuit of the Max Brenner story has indeed gone too far. The same reporter Cameron Stewart (August 13, 2011) tried to further humanize the franchise by running an article entitled “Targeted chocolatier Max Brenner ‘a man of peace’”. In this article Stewart wrote “it seems Max Brenner, the company’s founder, is perplexed and dismayed at finding himself as an unwitting symbol of the Palestinian-Israel conflict.” But, the missing truth from this heart wrenching story of a Jewish chocolatier trying to survive in the big anti-Semitic world is that the man doesn’t exist. Max Brenner, the corporate entity, was founded in 1996 in Ra’anana Israel, by Max Fichtman and Oded Brenner, using a conjunction of their names. Max Fichtmann is no longer associated with the Max Brenner entity. Oded Brenner remains. Since 2001, the company has become a part of Strauss Group: a cooperation that supports Israel’s military. There was never a Jewish chocolatier named Max Brenner yet the Australian senior reporter Cameron Stewart dedicated an entire article about this non-existent ‘man of peace’. It seems The Australian will do what it can to paint the BDS advocates as “radical” “anti-Semitic” and “anti-Israeli bullies” while ignoring the reasons behind the boycott call – Israel’s atrocious treatment of the Palestinian people, its land and water theft, its violence and terror against the population it occupies and its system of discrimination which has been likened by leading human rights organizations and advocates to the apartheid system which once plagued South Africa. The campaign for BDS is not “radical” unless in the views of The Australian calling for international law to be respected is a radical notion, but is affective and perhaps this is the greater danger and the reason why the right leaning newspaper The Australian is leading the fight against it. In demanding equality for Palestinians and Jews, BDS poses a great danger for Israel, a state that defines itself along ethnocentric lines and considers all non-Jews, including citizens of the state, a demographic threat. It is worth mentioning that I had a lovely cup of coffee just yesterday in St. Kilda in an area surrounded by Jewish owned businesses where I enjoyed an environment that was peaceful and pleasant. The good news is that there is no call to march on Jewish-owned businesses by any group of people. But also worth knowing is that if indeed Jewish businesses were ever targeted by any group I would not be surprised to find the same human rights advocates who are marching against Israel today standing to defend the Jewish community’s right to live free of racism and intolerance. These are the values held by the BDS movement: non- violence, equality, justice for all and zero tolerance for all forms of racism and discrimination. But you would never know that, if your primary source of information is The Australian newspaper. – Samah Sabawi is a Palestinian writer and is Public Advocate for Australians for Palestine. She contributed this article to PalestineChronicle.com. Omar Barghouti is an independent Palestinian political and cultural analyst whose opinion columns have appeared in several publications. He is also a human rights activist involved in civil struggle to end oppression and conflict in Palestine. Barghouti is a founding member of the Palestinian Campaign for the Academic and Cultural Boycott of Israel, PACBI. We the undersigned call on the Victorian Consumer Affairs Minister Michael O’Brien to withdraw allegations he made singling out several pro-Palestine advocacy groups calling for them to be investigated by the Australian Competition & Consumer Commission (ACCC) for an alleged suspicion that they may be involved in ‘secondary boycotts’ against Israeli-owned businesses in Australia. These allegations form an ongoing campaign of intensified attacks on Palestine solidarity organising and freedom of expression in Australia. We understand the current round of attacks to be a direct reaction to a growing international solidarity movement in support of Palestinian human rights, so we take the opportunity to reiterate our support for the Palestinian civil society’s call for boycott divestment and sanctions (BDS) from Israel. The BDS campaign is based on well-founded criticism of the Israeli state for its ongoing violations of international law, violations that include: Israel’s illegal occupation of Palestinian territories; its settlement-building and construction of an apartheid wall on occupied land; its refusal to respect the right of Palestinian refugees to return; and its ongoing military siege on the Gaza strip. 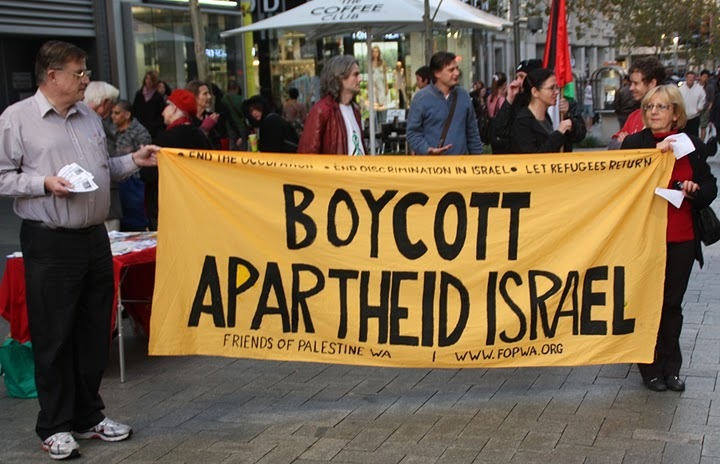 As in the past when the Australian people participated in the boycott campaign against apartheid South Africa, we affirm our right to participate in the BDS campaign against apartheid Israel in our churches, unions, professional bodies, local councils, parliaments and community groups. This campaign has provided a vital and viable framework and non-violent approach to building an anti-apartheid movement grounded in principles of international solidarity. 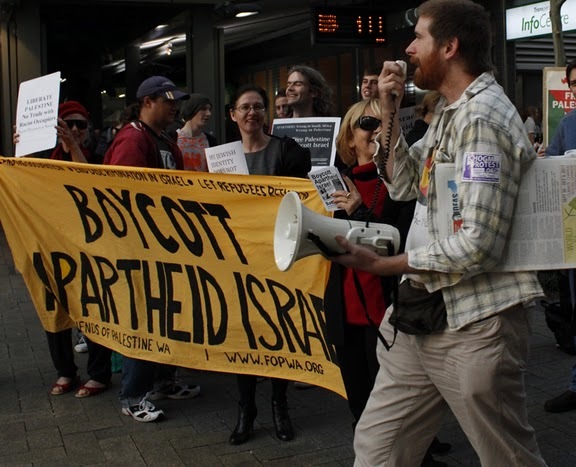 People of conscience in Australia, have a proud history of principled international solidarity through BDS campaigns – any legalistic attempts, employing anti-union laws such as the ‘secondary boycotts’ law, will fail to deter social justice groups from vocally advocating the BDS campaign and supporting Palestinian human rights. It is very disappointing that elected politicians choose to launch investigations into human-rights and solidarity organisations, rather than explain to the public why Israel is not held to account for its violation of the Fourth Geneva Convention and the Advisory Opinion of the International Court of Justice against Israel’s Wall and colonial settlements. The active attempts to repress Australian organisations that work to promote Israel’s accountability before international law is beyond reproach. 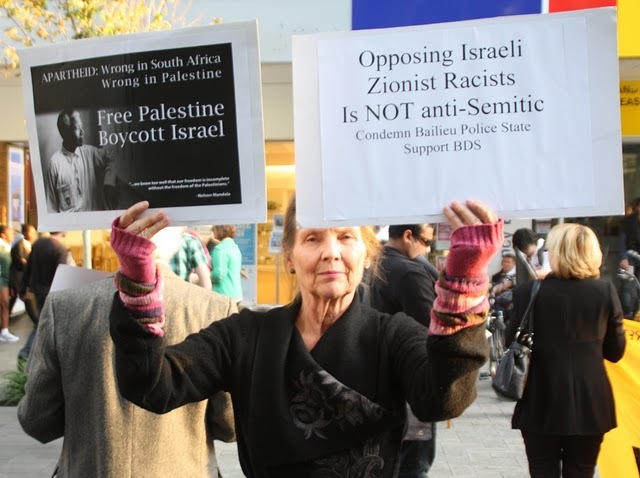 We stress that the BDS movement is an anti-racist movement that rejects all forms of racism including anti-Semitism and Islamophobia. The consumer-boycott campaigns are aimed at institutions and businesses that provide support for ongoing Israeli violations of international law, they do not target any particular religious or ethnic group. We note that most of the organisations named by the Minister for the investigation did not take part in the protest he refers to against Max Brenner stores in Melbourne. This is a clear indication that he has not looked closely into the matter, but is purely targeting all pro-Palestine advocacy groups on the basis of their support for BDS. Although, we may not have all participated in this specific protest, we strongly believe in the basic right to peacefully protest and raise awareness about businesses that have questionable policies and show blatant disregard for basic human rights. We urge elected officials to remember that their job is to protect rights and freedoms and to represent democratic values, not to waste our hard earned tax dollars on trying to appease a foreign state and those who blindly cheer for it.